Venture capital is the term used to call the financial resources provided by investors to startup firms and small businesses that show potential for long-term growth. It has become a very important source of capital for entrepreneurs, who often have problems with financing their needs through risk-averse banks. Venture capital investments incorporate a high level of risk as only a part of the VC companies develop into successful and high-return bringing businesses. The leading venture capital investors in the U.S. in terms of number of deals in which they assisted, were New Enterprise Associates, Keiretsu Forum and GV. In the United States, the years 1999-2001 were the most prosperous for venture capital investments in terms of the value of investments and number of deals. 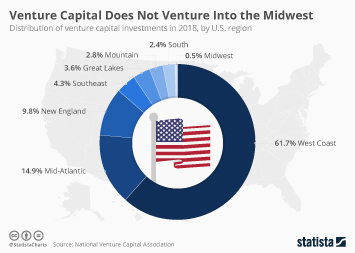 In 2017, the value of U.S. venture capital investments amounted to nearly 72 billion U.S. dollars. The software sector dominated the U.S. venture capital investments in 2017, with about 30 billion U.S. dollars U.S. venture capital deals. It can be explained by the presence of Silicon Valley, where a large amount of hi-tech companies are concentrated. Value of venture capital investment in the U.S.
Value of venture capital investments in software industry in the U.S.
3. Fundraising volume in U.S.
4. Deals in the U.S.